In our last post, we had presented a few samples from the history of figureheads on vessels through the ages. During the weekend, we serendipitously run into some very recent pictures of the figurehead of the United States Coast Guard Cutter „Eagle”, presently moored at CG Yards in Curtis Bay, Baltimore, Maryland, until the middle of January, undergoing routine maintenance. 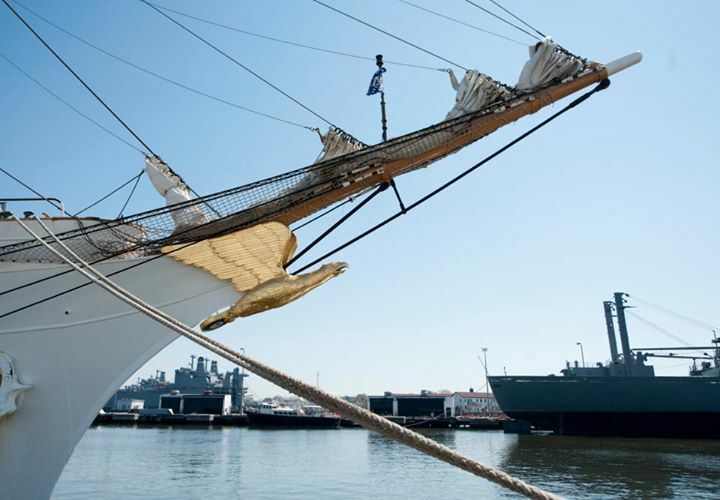 The CG Cutter „Eagle” (WIX-327) is the largest tall ship flying the Stars and Stripes and the only square-rigger in U.S. government service. 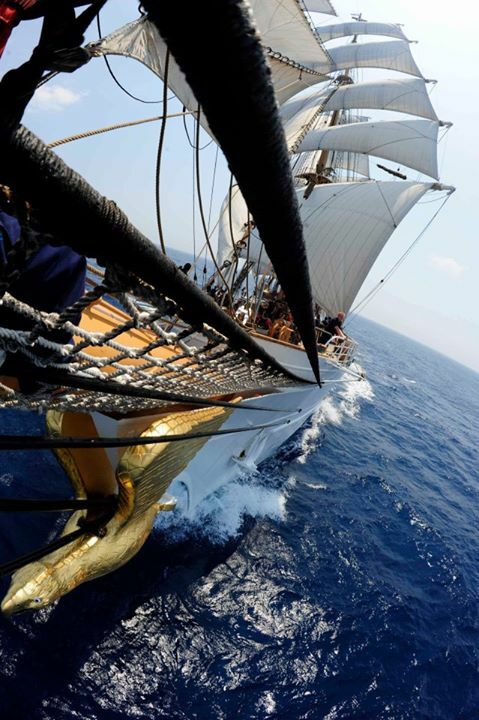 A three-masted barque, Eagle’s foremast and mainmast carry square sails and her mizzenmast carries fore-and-aft sails. The vessel is 295 feet long (231 ft at waterline), 39.1 ft beam and when fully loaded, 16ft draft. The vessel is 1,824 tons displacement, and having two anchors of 3,500 lbs (port) and 4,400 lbs (starboard). Both foremast and mainmast have a height of 147.3 ft, whereas the mizzenmast is 132.ft. Fore and main yards are 78.8 ft, with 22,300 sq.ft. sail area, and six miles of rigging (standing and running). Speed under full sail is 17 kts and under power 10 kts (one 1,000 HP Diesel D399 Caterpillar engine.) Dimensions in metric: length overall: 90 m, at waterline 71 m, beam of 12 m, height of foremast and mainmasts at 44.9 m, mizzenmast of 40.2 m, sail area of 2,030 sq.m. The ship was built in Hamburg, Germany by Blohm + Voss (Shipbuilder’s Hull No 508, Hull No 509 was the battleship „Bismarck”) and was launched in 1936 as Segelschulschiff „Horst Wessel” in the presence of Adolf Hitler. The ship was originally named after Horst Wessel, a Nazi party leader. The ship was built as a sail training ship operated by the pre-World War II German navy (Kriegsmarine), and was designed and constructed by John Stanley. The ship was built at the end of the sailing ship era, and she integrated all of the advances and knowledge acquired from sailing and trading tall ships. She’s of the Gorch Fock class and six sistership vessels have been built on the same design (with minor modifications): „Gorch Fock I” (1933), „Sagres III” (ex Albert Leo Schlageter) (1937), „Mircea” (1938), „Herbert Norkus” (1939), and the „SSS Gorch Fock” (1958). With exception of „Herbert Norkus” which had to be launched prematurely and unfinished, since the berths were needed at that time for building submarines, and was sunk in 1947, the rest of the Gorch Fock sisterships still sail today and grace with their sleek silhouettes the waters. The SSS „Horst Wessel” was taken as prize of war in 1946 by the United States (also „Sagress III’ was taken by the US, while „Gorch Fock I” and „Mircea” by the Soviet); she was commissioned with the Coast Guard under the name „Eagle” with homeport in New London, Connecticut. 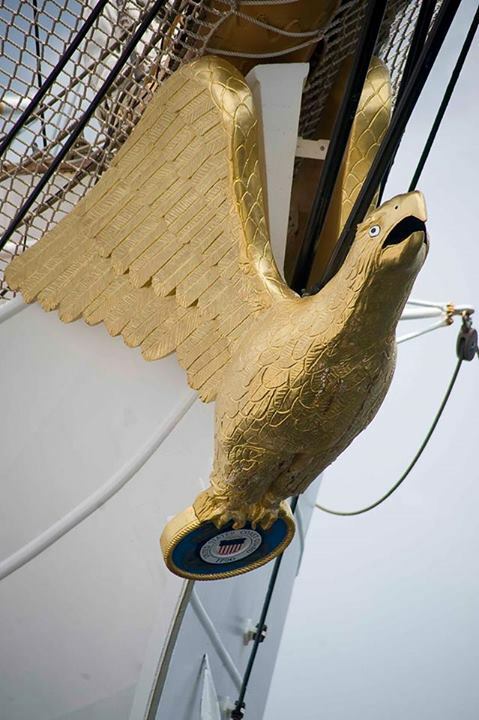 USCGC Eagle is the sixth U.S. Coast Guard cutter to bear the name in a line dating back to 1792. The vessel is presently used as a cadet training vessel for the US Coast Guard and is a popular tourist attraction on her port calls sailing worldwide, with her compliment of six officers and 56 enlisted. The ship was built at the twilight of the sailing era and her lines, masts and hull embody all the grace and knowledge of sailing tall ships but built at the era of steel which includes both rivets and welding; her hull is riveted Krupp steel four-tenths of an inch thick (10mm). There are two full-length steel decks with a platform deck below. The raised forecastle and quarterdeck are made of quarter inch steel overlaid with three inches (76 mm) of teak, as are the weather decks. The ship has under an intense inspection and maintenance schedule by the US Coast Guard with scheduled drydocks every four years and annual inspection. Because of her unique built and rich history, her maintenance is actually a preservation act of a floating historic monument. 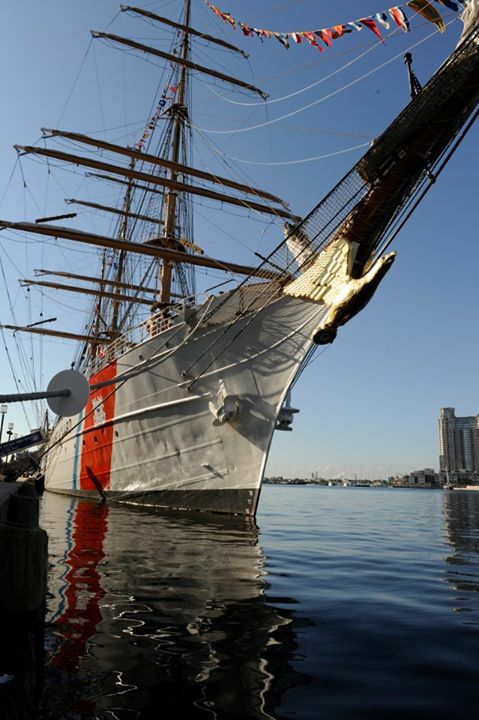 Since her commission with the USCG, she has undergone several major refurbishments and improvements in order to maintain her seaworthiness but also to comply and benefit from advantages in technology. Major changes include the replacement of her original1936 Burmeister & Wain diesel engine with a D399 Caterpillar engine. 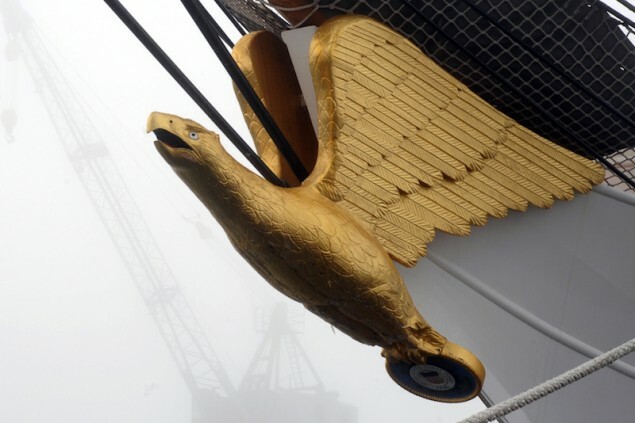 The figurehead of the ship is the ship’s namesake and the United States national bird, the bald eagle. The figurehead is made of wood and weights three-quarters of a ton. 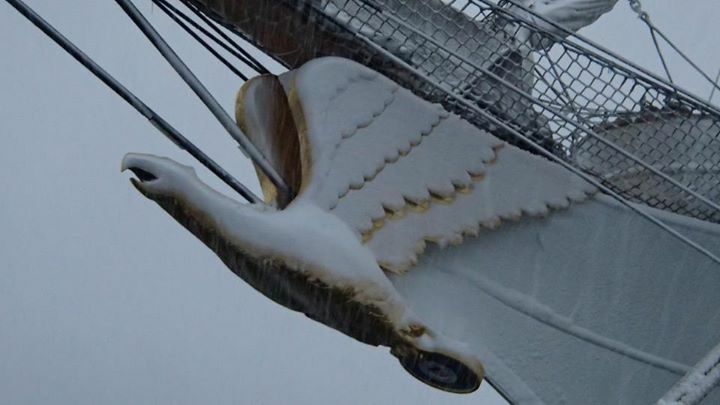 During the ship’s last drydock in January 2012, the figurehead was removed from the ship, had extensive work done by master carpenters as the wood was cracked and then painted in (fake) gold. NB: all images under this posting are taken from the United States Coast Guard site or affiliated entities, and we are grateful for the reproduction. This entry was posted in Maritime History and tagged Basil M Karatzas, Karatzas Marine Advisors & Co. on November 20, 2013 by Karatzas Marine Advisors & Co.. I am looking for information on John Stanley who designed and constructed the Eagle. Where he was from, and really any further information. How did he come to be the designer of a “German at the time” boat? ANy information or pointing me in the direction of how to find this information out would be greatly appreciated.